It is Fall in Arizona, since it is so hot here in the summer it will soon be time to play in the dirt. Whether you are preparing your winter garden or trying to figure out some activities to do with your kids (Fall Break is around the corner). Here is an experiment that you can try to demonstrate how batteries work. 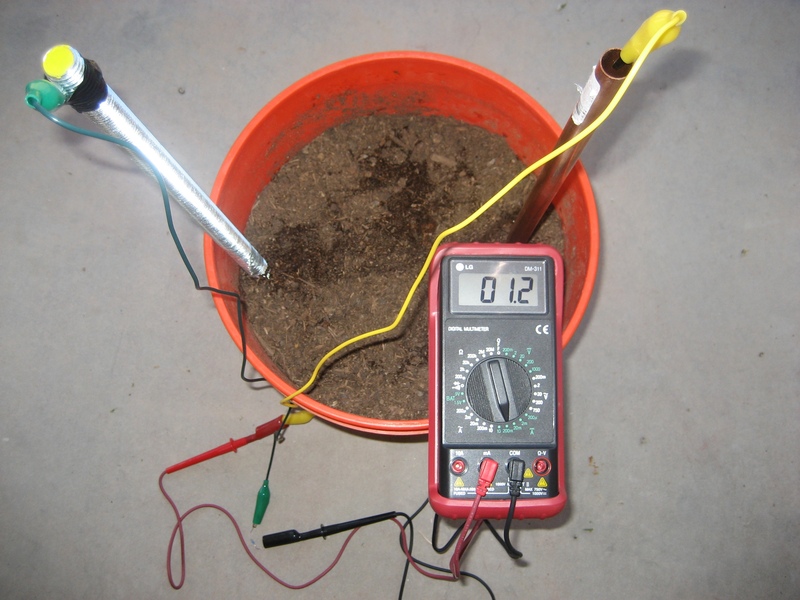 We will be exploring Earth Batteries, an Earth batteryW uses dirt and water as the electrolyte between two dissimilar metals (for galvanic corrosionW). For this experiment we will be using Copper and Zinc as our two metals. Copper was selected for it’s positive potential and Zinc for its negative potential. Plus soilW usually contains copper and zinc therefore we are minimizing the contamination of the sample soil. See the table below, of different materials have different positive and negative electric potentials. Fill the 5 gallon bucket with the 4 gallons of dirt. Place the copper pipe on one side of the bucket. Place the zinc plated rod on the opposite side of the bucket, try to maximize the distance between the zinc plated rod and copper pipe (electrodes). Clip one test jumper lead to the copper pipe. Attach another test jumper lead to the zinc plated (I affixed it to the rod with electrical tape). On the test jumper lead that is attached to the copper rod clip the free end to a 10 Ohm resistor. 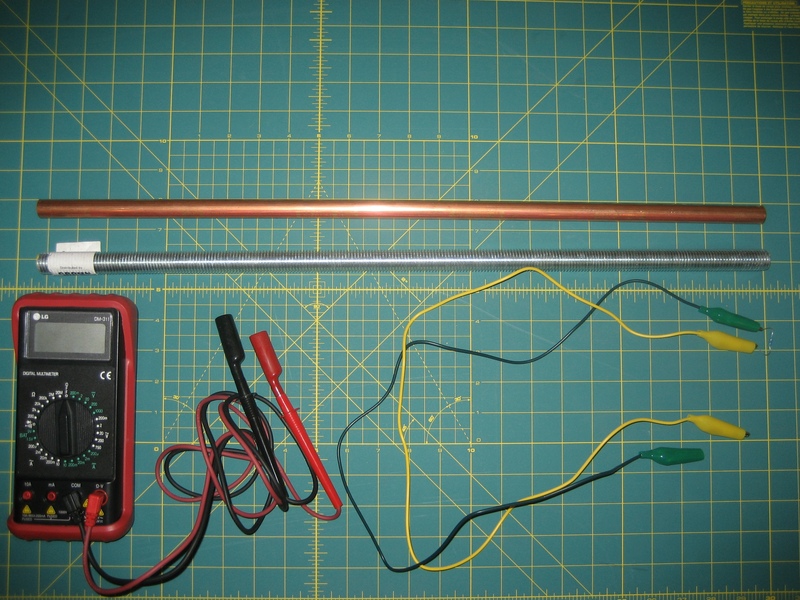 Attach the free end of the resistor to the positive lead of your multimeter. 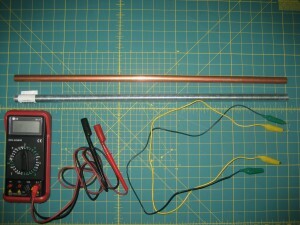 Attach the test jumper leaf that is attached to the zinc rod to the negative lead of your multimeter. Turn on your multimeter to measure DC Voltage. Take your water and start to fill the bucket with water, you will want to pour the water in a path between the zinc plated rod and the copper pipe. Watch the voltage increase as you pour the water. 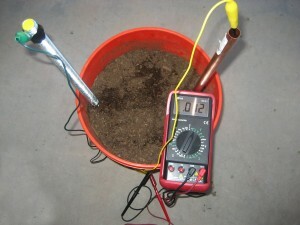 Congratulations you are producing electricity in your Earth battery bucket.